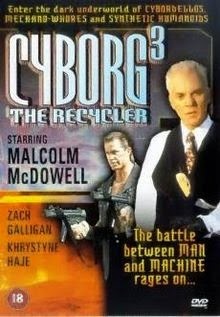 I had heard of Cyborg, the quiet underappreciated performance of Jean Claude Van Damme. 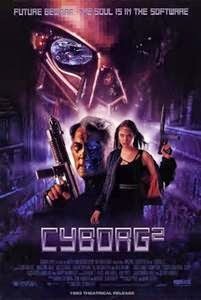 I had NOT heard of Cyborg 2, which is beyond me given that Angelina Jolie stars in it. Why doesn't she talk about it? "In the year 2074, the cybernetics market is dominated by two rival companies: USA's Pinwheel Robotics and Japan's Kobayashi Electronics. Cyborgs are commonplace, used for anything from soldiers to prostitutes. Casella Reese is a prototype cyborg developed for corporate espionage and assassination. She is filled with a liquid explosive called Glass Shadow. Pinwheel plans to eliminate the entire Kobayashi board of directors by using Casella. Casella is programmed to mimic human senses and emotions such as fear, love, pain and hate. Guided by the renegade prototype cyborg Mercy, who can communicate through any electronic device, she and her combat trainer Colton Ricks escape the Pinwheel facility so she can avoid self-destruction, something that most corporate espionage cyborgs face. They're relentlessly pursued by Pinwheel's hired killer, Daniel Bench." None of those words made any sense to me before I saw the movie. Then I saw the movie. These words still do not make sense. So if any of you stop me on the street and ask me what Cyborg 2 was about, I'm just going to give you the plot synopsis for Tomb Raider 2: The Cradle of Life. I'm not saying Angelina Jolie isn't a good actress - she is. She also has something I don't which is a few Academy Award nominations and the ability to look good in a pair of horns. 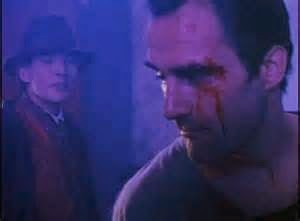 This film seemed to be her finding her way, deciding on her style. You can't accuse Angelina of not trying. She clearly is. This is the other main character of this film. The casting call read "A Jean Claude Van Damme type. If Jean Claude doesn't show up, then someone with the similar hairline." Clearly, this guy was the first to show up in the casting office. His acting style said "Women are generally very impressed with me. I think." Look, I know by this point, you're asking, "What about the hot cyborg action?" Angelina Jolie trusts Hairline McTanktop to save her from self destruction. People are mildly concerned about it. 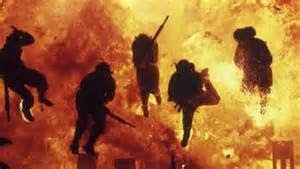 Although this explosion does happen. Seeing this never made me wish for a big musical number to break out more. Lets talk about the best part of this movie. You'd think it was the endless board meetings this movie schedules us in for, but you'd be wrong. 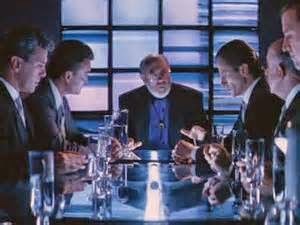 Although, in the future, things actually get done during meetings. 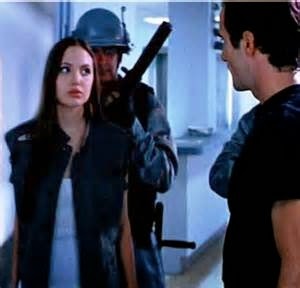 You might also think it was one of the times (there wasn't many) when Angelina did spring into action and lightly graze a guy in the upper chest. The sound effect it made was way worse. 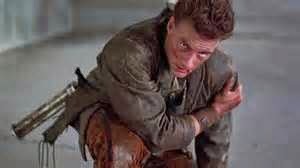 You might also think it was one of the many times this movie liberally borrowed from The Terminator, but you would be wrong. 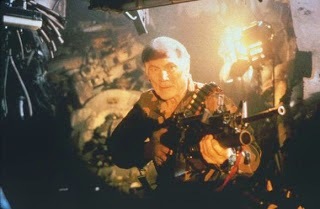 Jack Palance doing his best to out Jack Palance himself. Which he succeeds gloriously. 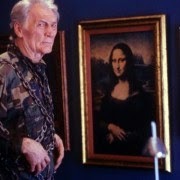 This screenshot of Jack Palance standing next to the Mona Lisa makes me want to frame it, then hang it up next to the actual Mona Lisa. That's how much of a treasure he and his performance in Cyborg 2 is. 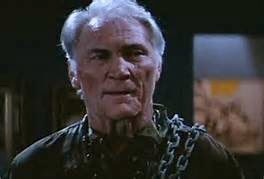 Once you introduce Jack Palance in a scene, every scene that doesn't feature him, makes you miss him. You know how I know that the future is in good hands? Because Jack Palance is handling it. Because of him, Angelina takes a moment, and breaks out of pretty face and gives it her all. Meanwhile, Rogaine McManCleavage tries to save the world. He's kind of successful.